Cellphones and other devices could soon be controlled with touchless gestures and charge themselves using ambient light, thanks to new LED arrays that can both emit and detect light. 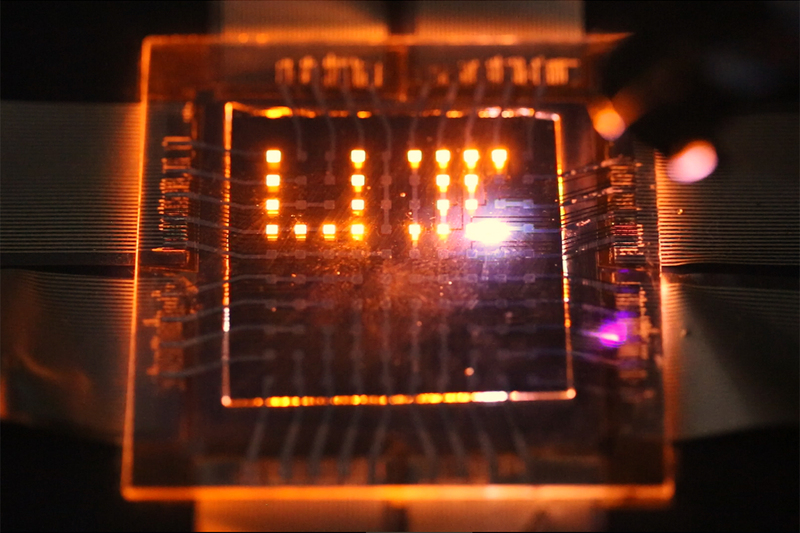 Made of tiny nanorods arrayed in a thin film, the LEDs could enable new interactive functions and multitasking devices. Researchers at the University of Illinois at Urbana-Champaign and Dow Electronic Materials in Marlborough, Massachusetts, report the advance in the Feb. 10 issue of the journal Science. A laser stylus writes on a small array of multifunction pixels made by dual-function LEDs than can both emit and respond to light. The tiny nanorods, each measuring less than 5 nanometers in diameter, are made of three types of semiconductor material. One type emits and absorbs visible light. The other two semiconductors control how charge flows through the first material. The combination is what allows the LEDs to emit, sense and respond to light. The nanorod LEDs are able to perform both functions by quickly switching back and forth from emitting to detecting. They switch so fast that, to the human eye, the display appears to stay on continuously – in fact, it’s three orders of magnitude faster than standard display refresh rates. Yet the LEDs are also near-continuously detecting and absorbing light, and a display made of the LEDs can be programmed to respond to light signals in a number of ways. For example, a display could automatically adjust brightness in response to ambient light conditions – on a pixel-by-pixel basis. 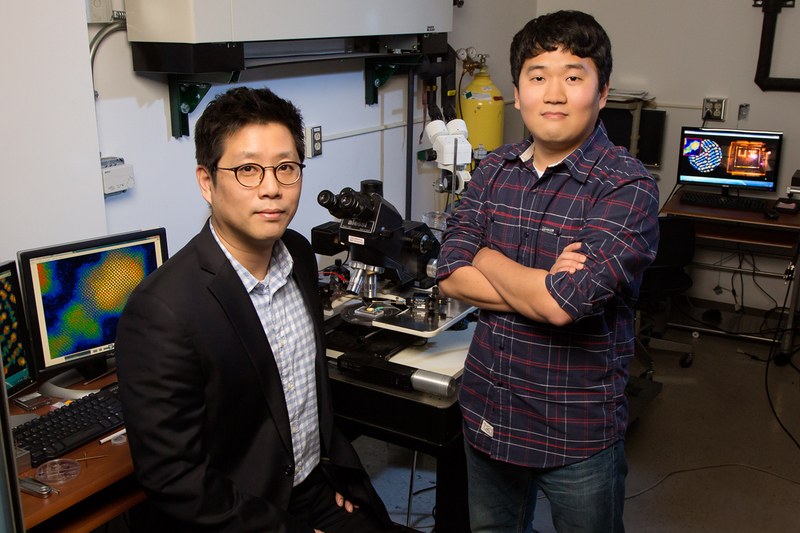 Professor Moonsub Shim, postdoctoral researcher Seongyong Cho and collaborators developed dual-function nanorod LEDs that could be the basis for multifunctional device displays. The researchers demonstrated pixels that automatically adjust brightness, as well as pixels that respond to an approaching finger, which could be integrated into interactive displays that respond to touchless gestures or recognize objects. They also demonstrated arrays that respond to a laser stylus, which could be the basis of smart whiteboards, tablets or other surfaces for writing or drawing with light. And the researchers found that the LEDs not only respond to light, but can convert it to electricity as well. In addition to interacting with users and their environment, nanorod LED displays can interact with each other as large parallel communication arrays. It would be slower than device-to-device technologies like Bluetooth, Shim said, but those technologies are serial – they can only send one bit at a time. Two LED arrays facing each other could communicate with as many bits as there are pixels in the screen. The researchers did all their demonstrations with arrays of red LEDs. They are now working on methods to pattern three-color displays with red, blue and green pixels, as well as working on ways to boost the light-harvesting capabilities by adjusting the composition of the nanorods. This work was supported by a collaborative research effort between the Dow Chemical Company and the University of Illinois, with the aim of advancing technologies important to industry. The National Science Foundation also supported this work. Nanoconfinement: A Boon for Hydrogen Vehicles? Which Exercises Burn the Most Calories? Why Do Meteors Make Spooky sounds?